Choose a payment plan to open an account and get started. Unlock a bike right away using your assigned 6-digit account number (or tap your Member Card) and enter the PIN you created during registration. You can ride anywhere within our service area. Your payment plan determines the cost of your ride. To end your trip, just lock your bike to a rack in one of our 115 hub locations. You do not need to return your bike to the same hub you started from. Check out the Pricing “bonus features” to find out about out of hub locking options. Pick up any bike from any hub and return it to any other hub. You can even lock a bike outside of a hub (eg to a post or regular bike rack within the service area) for a $1 convenience fee! Use a bike as part of a multi-modal commute. Walk - Bus - Bike - Walk - once returned, the bike is no longer your responsibility. Never worry about bike thieves again. No more dealing with flat tires and maintenance issues. Get a flat? Immediately switch bikes and we’ll take care of the repair. Running late for the bus or your meeting? Bike share is great for short, one way trips. Be spontaneous! Use SoBi on a whim. Are you a Mac student? Free time can be split between an unlimited number of trips each day. Locking at any of the 130 hub locations is always free of charge. Lock to any regular bike rack within the service area for $1 convenience fee. Use the “hold” feature¹ to lock your bike for short stops (up to 60 minutes). Your bike is reserved just for you and this counts for your ride time. Reserve¹ a bike up to 20 minutes in advance of your ride by logging in via website or mobile app. Reservation time counts for your ride time. When you return an out of hub bike to a SoBi hub at the end of your trip you receive a 75 cent riding credit. *Additional riding beyond the free daily time included in the Monthly plan is billed at a rate of 9 cents per minute. Multiple rentals at one time will also be charged at 9 cents per minute for guest riders. ¹Reservation time and hold time are counted as ride time since the bike is not available to other users. Locking a bike outside of our system area will result in a $25 recovery penalty. When you end a trip or put it on hold it should always be publicly accessible and locked to a secure object using the ubar. There is a $15 penalty for improper locking (ie when a bike is locked only to itself). Join our newsletter for updates about promotions and events. Download our app, and ride today! Operational funding is not provided through municipal taxes. Costs are recouped through membership fees, sponsorship funding, and in-kind services provided by our community partners. Surplus revenue will be fed directly back into the system to provide additional bikes, hubs and service enhancements. SoBi Hamilton represents a remarkable co-operation between the province and the city, plus its citizens, local professionals, non-profits, and businesses both small and large. Please contact us if you are interested in supporting your community bike share system. All SoBi Hamilton riders are entitled to a one-time $15 account credit when they join Community Carshare! Bike sharing is an innovative year­-round transportation system that allows users to take one­-way trips via publicly accessible bikes. 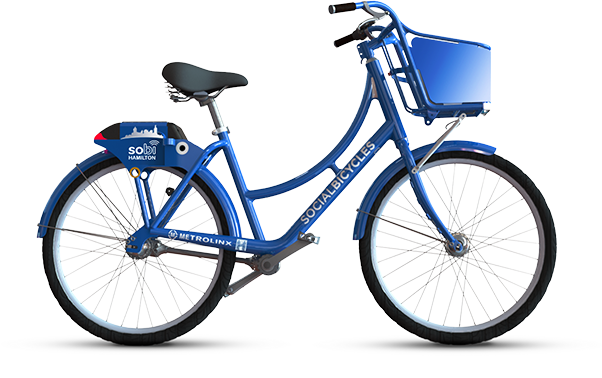 The SoBi Hamilton fleet is made up of specially designed, heavy­-duty bikes that are located at over 130 hubs across the city. Bikes can be returned to any hub anywhere in the system, creating an efficient network with many possible connection points and combinations of departures and arrivals. Users can purchase any level of membership online, at a kiosk, or at the SoBi Hamilton office. Once registered, riders can walk up to any bike to use it, or optionally reserve a bike in advance using the website or mobile app. To release a bike, simply enter your 6-digit account number (or tap your member card on the keypad) and 4 digit pin code onto the unit on the back of a bike. This will unlock the bike and you are ready to ride. When you arrive at your destination, return and lock the bike at a SoBi station. The bike is now available for others to use. (Bikes may also be locked to any regular bike rack or secure object like a sign post for a $1 fee). If you return an out of hub bike to a hub at the end your trip then you earn a 67¢ credit (equivalent to 10 minutes or riding). Please note riders should always end their trip within the service area and the bike must always be securely locked to a fixed object when locking a bike or putting it on hold. Who is bike share for? Is there a minimum age? Bike share is residents and visitors alike! In cities all over the world bike share is used for commuting to work and school, running errands, riding with friends, riding to a transit stop, and generally getting around. For tourists, bike share makes it easy to explore the hidden corners of a city where transit doesn’t go — plus the bikes are available 24 hours a day, not just during business hours. Citizens and visitors who never use the bikes will realize benefits as well. By providing a viable alternative for short trips, bike share systems help to alleviate pressure on our roads. They replace car trips, reduce traffic, free up parking spaces and ease the burden on the transit system for short trips. And these benefits grow over time,as bike share programs have the ability to draw non­-cyclists into the world of short­-distance urban cycling — and each new cyclist represents additional savings to our road and transit budgets. SoBi Hamilton’s bike share system is available to everyone who is 16 years of age and older. 16 and 17 year old riders must have the permission of their parent/guardian. I already own a bike. Why would I need bike share? When would I use it? Even those who own a bike can benefit from bike share. For impromptu trips, it’s easy to grab a bike from any station, even if you don’t have your bike with you. If you take transit on a rainy morning, you can take a bike home if the sky clears. If you happen to be out with a group of people, everyone can cycle to another destination with the help of bike share, even if only a few people brought their own bikes. If you are worried about bike theft, you can use bike share for trips where your own bike may not be able to be safely stored. It’s the missing ingredient that makes multi-­modal transportation work. I have a transit pass. When would I use bike share? Bike share complements transit and is great for first and last mile connectivity. Unlike many bus routes, bike share is available 24 hours a day and is a great way to get between your bus/train stop and destination or to avoid inconvenient transfers for a leg of your journey. Bike share is also great for leisure! Many riders use the system for fun rides and to integrate more physical activity into your life. Yes! SoBis are comfortable, sturdy bikes that are routinely maintained by professional mechanics. All SoBis have front and rear lighting, a bell, and reflectors. SoBi’s visibility and the sheer increase in the number of cyclists will create a great platform to further educate Hamiltonians on how to safely share the streets. The City of Hamilton continues to improve cycling infrastructure to improve access and safety for all road users. Using the anonymous data we collect from the bikes, SoBi Hamilton looks forward to sharing information with the City so they can be better informed as to where cyclists are travelling, how infrastructure can be improved, and where to prioritize bike lanes. According to Ontario legislation, cyclists over the age of 18 are not required to wear helmets, however we recommend riders wear helmets and follow all recommended safety rules of the road. All riders who are 16 or ­17 must wear a helmet. We will be offering urban cycling safety workshops for interested riders. If you’d like to participate, and for information about subsidized helmet purchases, please contact us. Is there a cost to use bike share? Yes. To use the Hamilton bike share system you must purchase a membership. You can do this on this website, using the SoBi app, or at one of our kiosks. See the pricing section for more details on the pay as you go plan (9¢/minute) and monthly membership ($15/hour, includes 90 minutes of ride time per day). If you have a low income you may qualify for our subsidized memberships as part of our Everyone Rides Initiative. You can find out more at hamiltonbikeshare.ca or by calling the SoBi office at 289-768-2453. Memberships can be purchased on our website ( http://sobihamilton.ca), on the SoBi app, or at any designated hub kiosk (located at both GO stations, Gore Park, Gage Park, Westdale, and Bayfront Park). I don’t have a credit card. Can I still use bike share? We currently accept Visa debit in addition to credit cards (American Express, Mastercard, Visa). Most debit cards from major Canadian banks are Visa Debit and are therefore accepted. The prepaid pay as you go membership option allows you to use a prepaid card. With this membership you must carry a positive balance and use a verified email address. You may also qualify for our Everyone Rides Initiative passes, which includes a $3 cash pedal pass. What is the replacement cost of a lost, stolen, or damaged bike? The replacement value of a SoBi is $1500. When you properly lock up the bike at the end of your trip, it is no longer your responsibility. If a bike is stolen, you are required to file a police report and contact SoBi Hamilton as soon as possible. What happens if I lock up a bike outside of the service area? Bikes area available to use throughout our large service area (over 30 square kilometers!). Please review the system boundaries on our map. If you lock up a bike outside of the system (i.e. in Burlington or Stoney Creek) there is a cost to our team to collect that bike and you will be charged $25 retrieval penalty. We recommend you end your trip within the service area. You also have the option to put a bike on hold if you are stopping while out of the service area but plan to complete your ride within the system. To learn more about how to use the hold feature please click here. All users can see the service area on our map (at sobihamilton.ca, on the SoBi app, or on our brochures). What do I do if the bike is in need of repair? SoBi Hamilton maintains all of the bikes. If you check out a bike and it is in need of repair, simply press the repair button before you lock the bike. You can then use the on-­bike menu to select the type of issue (i.e. flat tire) so our team can address the problem. This will also ensure that the bike is not available for others to ride until it is repaired. You can now access multiple bikes on one account! This is great for when you have an out of town guest or a friend who wants to try the system with you. Each account holder can take up to 2 guests (plus themselves). The account holder will pay for guest ride time at rate of 9¢ per minute. If you have a monthly subscription your free daily ride time cannot be used by guests. When a guest logs into a bike the account holder will need to enter their user number and pin code. Then the guest will need to consent to the terms and conditions that appear on the screen of the bike. Can I change my membership type or end my membership? 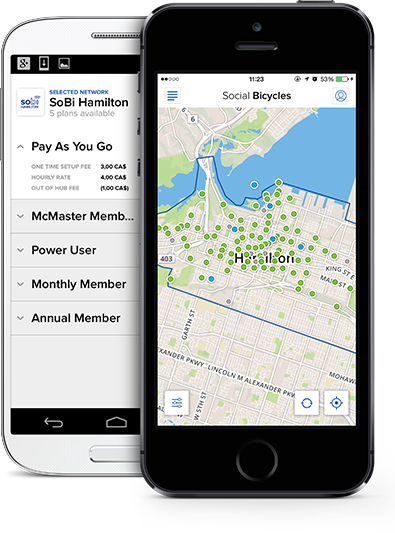 Yes, all our users can the ability to change their membership at any time by logging onto the user interface through sobihamilton.ca or the SoBi app. Users can unsubscribe their membership in their Network Settings if they no longer want to use their membership or if they’d like to resubscribe to a new membership type. Click here for more information on how to change, unsubscribe or reactivate your account. If I sign up for a membership does it automatically renew? When you sign up you are given the option to turn autorenew on or off. To learn how to turn the autorenew option on or off, please click here. How did you choose station locations? There were several considerations that were part of our decision­-making process for selecting station locations. We used international best practices (in accordance with the ITDP) for determining station density and placement throughout Hamilton, analyzed neighborhood characteristics (including housing density and commute trends), underwent a public feedback process with Hamilton residents, and consulted with several City departments (Parking, Traffic, etc) for each station to ensure there are no obstructions or safety issues for pedestrians, motorists and cyclists. We are also limited by what space is available as most of our stations are on City property and we did not want to remove parking spaces. The public engagement report can be viewed here. Some bikeshare hubs are designed as destination hubs and some are designed as feeder hubs. Feeder hubs are usually found in neighborhood areas on smaller streets where residents are likely to take a bike and use it for running errands or work commutes. This is similar to a neighbourhood bus stop on a smaller, less frequent bus route. Feeder hubs are named as such because they help residents get to destination hubs conveniently. A destination hub is usually found in areas with significant commercial, cultural or employment uses. Regardless of the hub type, the system was designed to have the recommended hub density of 300m to 600m between hubs. This ensures that hubs are conveniently located, user friendly and more likely to have high usage rates. There was a specific amount of funding available to purchase station equipment which determined the number of stations that could be installed (and subsequently the size of the service area). In general, bike share systems are most successful when the stations are densely placed throughout the service area. Hamilton’s service area is quite large (over 15 square kilometers) and SoBi Hamilton plans to use future surplus revenue to invest in system expansion and improvement. Interested in getting a hub outside our existing service area? We encourage you to help connect us with prospective partners (businesses, organizations, Ward councillors, etc) who can sponsor a new station. This helps support our non-profit organization in covering our operational costs to service new stations and a larger service area. Why are there on­street stations? In all bike share systems it is common for some stations to be on­-street, some to be in boulevards and some to be on grass or in parks; especially in constrained corridors where there are limited siting options. A corral is an on­-street bike parking location, similar to a car parking location. Many cities in Canada and the United States place racks in on­-street corrals. There is a three step process for building a corral. First, the bike rack is deployed on the street; then reflective bollards are affixed to the pavement to surround the corral and alert motorists to the presence of the bike rack; finally, signage is placed alongside the rack to explain to users how to use the bikes and provide them with instructions for safe use. We have worked with various City departments including parking, traffic and parks to ensure that the placement of bike share stations on­ and off­-street are installed for safe and reliable use. Who is running the program? Who owns the bikes? SoBi Hamilton is the local, non­-profit operator of the system, and the bikes and racks are owned by the City of Hamilton. The City of Hamilton received $1.6 million funding from the Metrolinx Quick Wins program to fund the one-­time purchase of the bikes and station infrastructure. Social Bicycles was chosen as the system and equipment provider after submitting a proposal through an RFP process. No local taxpayers money was used to fund this project. While the City paid for the capital expenditure with the Metrolinx money, they do not financially support the operations. Operations of the bike share system are fully funded by membership fees and sponsorships. Since SoBi Hamilton is a non­-profit organization, any additional revenue from operations will be reinvested in the system to expand the service area and purchase new equipment. SoBi Hamilton is powered by Social Bicycles. Find bikes using our app!